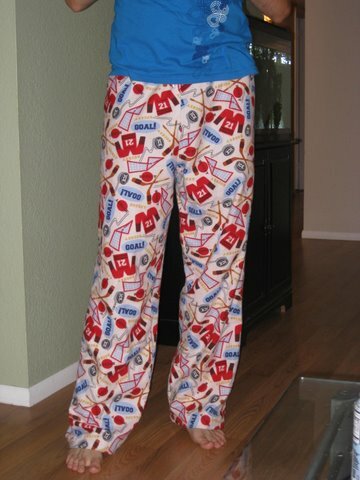 Here are the pants I made as a birthday gift a month ago. He’s been wearing them frequently, even when we hit the record for 113 degrees last week, so I think he likes them. They’re made of a very soft flannel. I started with Simplicity 9871 although I didn’t follow the pattern very closely, which seemed to work out fine for something this basic. I accidentally cut one of the pieces reversed, and sewed gigantic seam allowances when I realized the pants were huge around the hips and would come up to his ribcage. (See how high they’re wearing them in the picture??) Also, I don’t know how to use my machine’s buttonholer yet so I inserted the tie on the inside, and then used a piece of ribbon because I didn’t want to deal with making a matching fabric drawstring. He’s confident and doesn’t feel threatened by the cream satin ribbon holding up his 9-year-old-boy pjs. September 3, 2009. 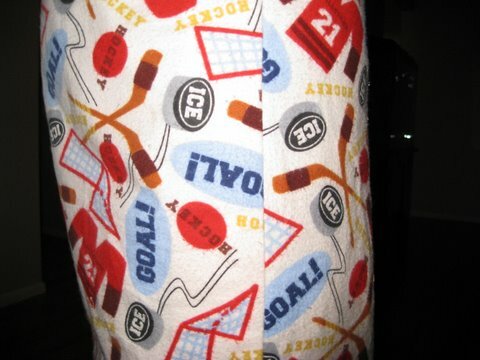 Tags: completed project, hockey, pajamas, pants. Links, Pictures, Projects, Words. 1 comment.